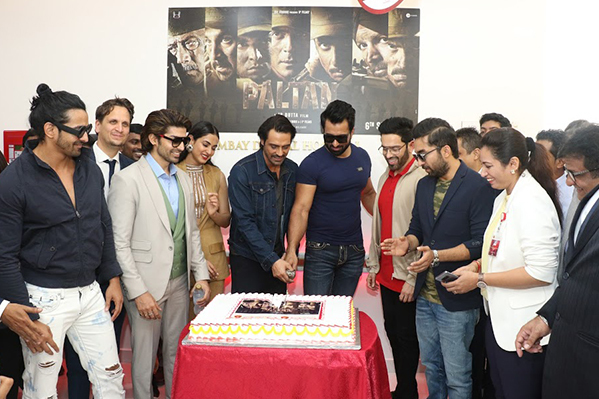 Bollywood stars from the upcoming movie ‘Paltan’ visited Thumbay Medicity – Ajman, on 16th August 2018. 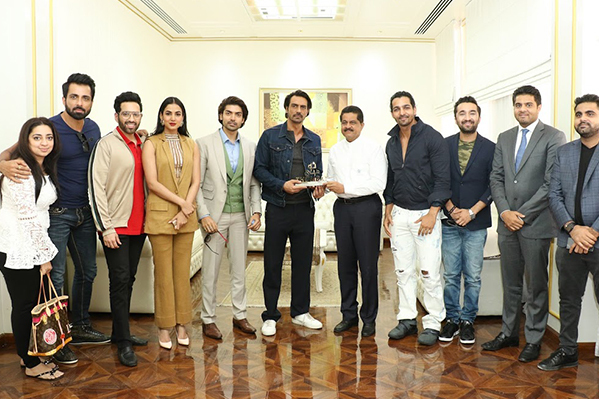 The visitors included Arjun Rampal, Sonu Sood, Luv Sinha, Siddhanth Kapoor, Harshvardhan Rane, Gurmeet Choudhary and Sonal Chauhan. 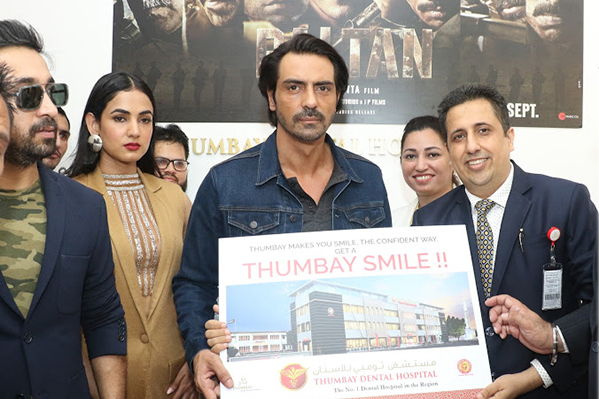 The celebrity actors were greeted at Thumbay Medicity by Dr. Thumbay Moideen – Founder President of Thumbay Group and Mr. Akbar Moideen Thumbay – Vice President of the Healthcare Division of Thumbay Group. The guests toured the advanced healthcare and medical education facilities at Thumbay Medicity including Gulf Medical University, Thumbay Dental Hospital, Thumbay Physical Therapy & Rehabilitation Hospital etc. They also met and interacted with fans and visitors. Touring the hospitals and the university, the actors complemented Thumbay Medicity for its state-of-the-art facilities for healthcare and medical education. They were briefed on the various services at Thumbay Dental Hospital – the first private dental hospital in the country and the largest academic dental hospital in the Middle East region’s private sector, as well as Thumbay Physical Therapy and Rehabilitation Hospital – the biggest and most advanced hospital for physical therapy and rehabilitation. The vision, mission and future directions of Thumbay Group and Gulf Medical University – the region’s leading private medical university, as well as the University’s advanced training and teaching facilities were also presented before the guests. The celebrity guests said that the facilities and technologies at Thumbay Medicity for healthcare, medical education and research were truly state-of-the-art and futuristic. They said that Thumbay Group’s impressive efforts to bring the latest technology and innovation in healthcare and medical education to the region were commendable. As the most cutting-edge physical therapy and rehabilitation facility in the region, Thumbay Physical Therapy and Rehabilitation Hospital (TPTRH) seeks to redefine the standards of physical rehabilitation by introducing innovation in the form of state-of-the-art technology, futuristic facilities, cutting-edge research and advanced learning. The hospital features cutting-edge amenities for physical therapy, such as Hydrotherapy Pool, Robotics and a unique Cryotherapy Chamber. One of the most remarkable components of the inpatient facilities at the hospital is its ‘Therapeutic Garden’, an innovative approach to rehabilitation intended to give patients a positive experience during their recovery. Thumbay Dental Hospital has a competent team of experienced and qualified dental specialists, delivering high quality dental services to patients at affordable costs. The hospital offers services and treatments in General Dentistry, Endodontics, Paedodontics, Periodontics, Invisalign, Veneers & Lumineers, Dentures, Crowns and Bridges, Simple & Complicated Extractions and Hollywood Smile. Specialized services also include Implants, Orthodontics, Lasers & Endodontic Microscopes, Cosmetic Dentistry, treatment for facial pain, complicated Oral Surgeries and Sleep Apnea. The hospital has an in-house dental lab for accurate dental Prosthesis. It also features dedicated CSSD for Infection Control. The actors also experienced the Marhaba Lounge, a unique offering from Thumbay Hospitals which delivers personalized services and fast-tracks patients’ requirements including registration formalities, consultation, examination/diagnosis, procedures, documentation, billing etc., requiring minimal waiting times. They also visited the Thumbay Pharmacy and Blends & Brews Coffee Shoppe outlets at Thumbay Medicity. Dr. Thumbay Moideen said that Thumbay Medicity was envisioned as the healthcare, medical education and research hub of the region, well-equipped to serve a floating population of 20,000. “The soon-to-open 500-bed academic hospital – Thumbay University Hospital – the largest private academic hospital in the region, combined with the dental and rehabilitation hospitals make Thumbay Medicity a unique destination for specialized care. Thumbay Medicity is also a referral facility to which primary and secondary care hospitals and clinics refer serious cases,” he said. Thumbay Medicity also houses Body & Soul Health Club and Spa, The Terrace Restaurant, Blends & Brews Coffee Shoppe, Thumbay Pharmacy etc.